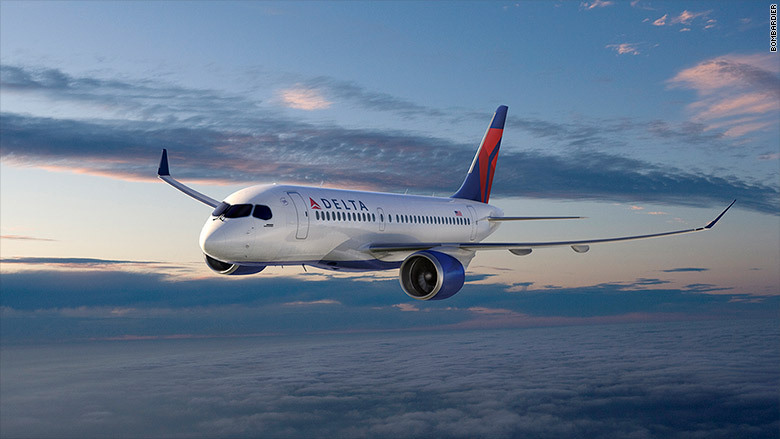 One way or another, Delta Air Lines (DAL) won't be paying the tariff the U.S. Department of Commerce wants to put on the delivery of each of its Canadian Bombardier C Series jetliners. "We do not expect to pay the tariffs and we do expect to take the planes," said Delta Chief Executive Ed Bastian on Wednesday morning on the company's earnings call. "We will not pay tariffs that are being discussed and debated." 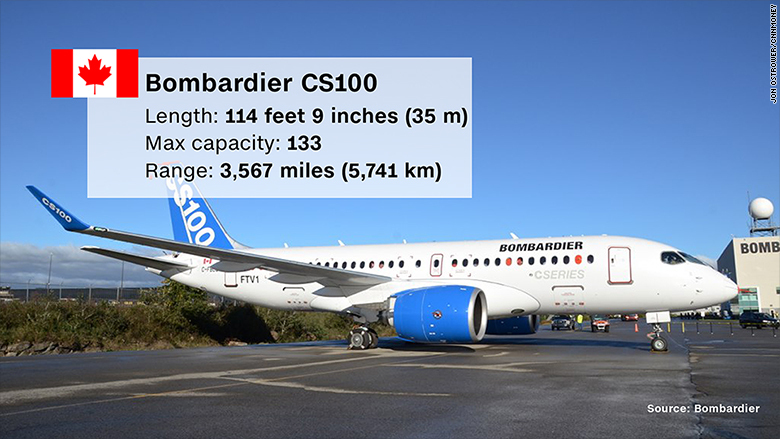 Performance stats for Bombardier's CS100. Delta in 2016 ordered as many as 125 new CS100 jets from the Canadian aerospace company, Bombardier. The deal sparked allegations by Boeing (BA)that the plane maker had sold the C Series to Delta at "absurdly low prices." Boeing took its case to the U.S. Department of Commerce, claiming the sale had harmed the U.S. manufacturer and its single-aisle 737 products. "In our opinion it is very difficult for Boeing or any U.S. manufacturer to claim harm with a product that we purchased that [Boeing] did not offer and they don't produce." Boeing stopped producing jets the size the Delta wanted to purchase in 2006. As part of Delta's competition between manufacturers to supply it small airliners, Bombardier offered the CS100, while Boeing offered used Brazilian regional jets, not all-new airplanes. "As you look through this and try to see how exactly a harm case is going to be developed, particularly to justify the type of tariffs that are being contemplated, to us it's unrealistic, a bit nonsensical." The trade feud has sparked a diplomatic row between the United States, Canada and the United Kingdom. Canada has threatened to kill a deal to buy Boeing F/A-18 Super Hornets, and the U.K. said future Royal Air Force purchases from Boeing might be in question should the tariffs be imposed. Bombardier employes more than 4,000 in Northern Ireland, where the jet's wings are manufactured. "We won't do business with a company that's busy trying to sue us and put our aerospace workers out of business," Canadian Prime Minister Justin Trudeau said last month. An artists conception of the Bombardier CS100 in Delta Air Lines colors. Bombardier's aerospace division employs 28,500 worldwide. 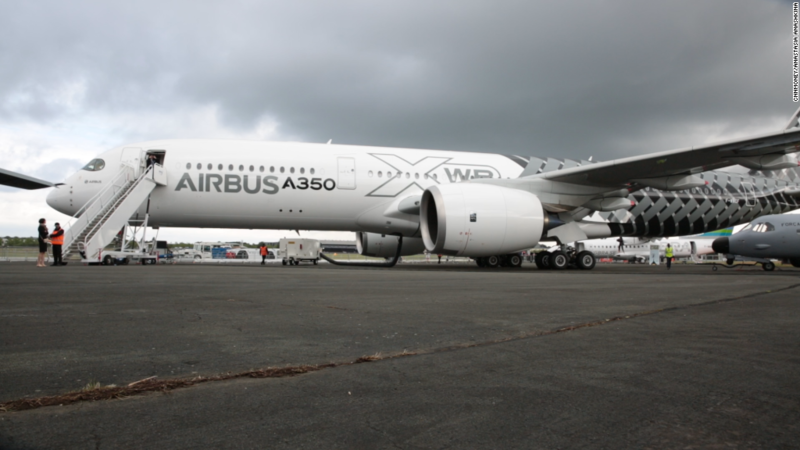 The airplane is also half produced by U.S. aerospace companies, including United Technologies which supplies the jet's Pratt & Whitney engines. The prime minister said he told Trump he "disagreed vehemently" with the rulings. "It's inconceivable that we would make military purchases of Boeing aircraft if Boeing continues to behave that way," Trudeau, speaking French, said through a translator at a press conference. "It wasn't an easy conversation, but it was an important conversation to have." Bastian said the airline is crafting "various other plans that we're also contemplating and looking at, alternatives which I will not get into" should the aircraft's arrival in its fleet be delayed past spring 2018, when the first delivery is scheduled. "We will not pay those tariffs," he said. "And that is very clear."